Wordle is an excellent tool. It is probably my favorite, so far. I love the idea of putting in a passage or piece of writing and having this system show you the most mentioned words in the piece of writing in such a visual way. The most common words are often larger, repeated and sometimes bold. This tool summarizes a piece of writing in the way a graph summarizes data. It makes themes easily understood in a visual way. It can help highlight themes and underlying messages that may not be obvious when you first read or glance at the piece. 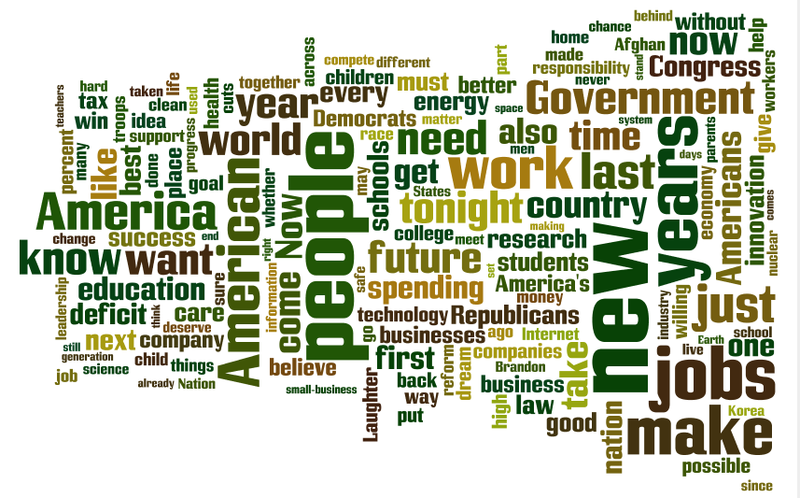 I used Wordle to examine President Barak Obama’s State of the Union Addresses from 2010, 2011 and 2012. 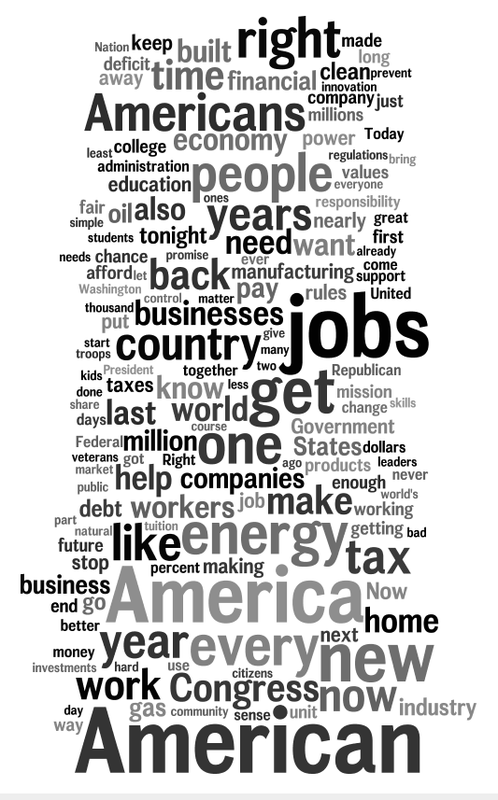 Common themes and words in the 2010 State of the Union Address were: Now, economy, business, people, American, jobs, work and government. This was his first time addressing the nation as president unless you count his speech in 2009. Common themes and words in his speech in his second year were: New, people, years, work, American, world, country, future and spending. 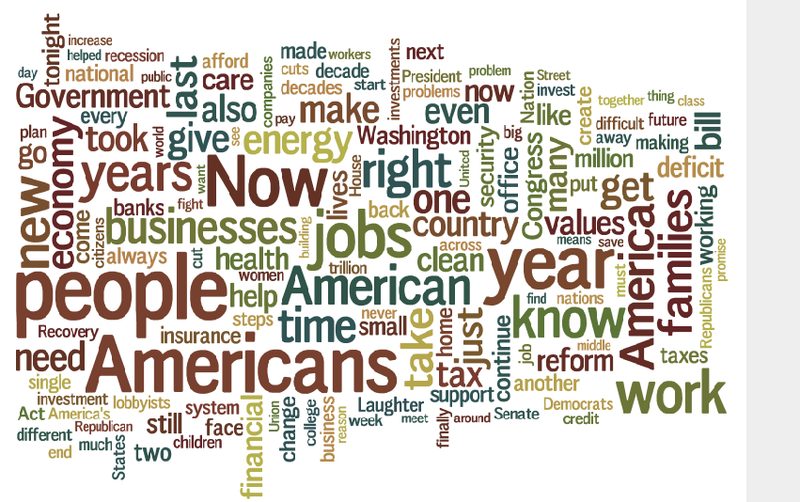 His common themes and words in 2012 were: Right, time, Americans, jobs, one, people, economy, energy, tax and congress. By looking at these three speeches, we can see that his addresses to the nation have had a consistent theme. He has focused on addressing the American people about the future, the economy, jobs and spending. Becoming bigger each year was the mention of energy and jobs. Tools like Wordle can help journalists spot changes in focus, emphasis and importance in certain aspects and areas by looking at the words used. The tool is also neat because you can choose colors, fonts and different ways to present your Wordle cloud. This is something you could easily spend a lot of time playing around with and more importantly, analyzing.